HP LaserJet Pro 100 printer is a multifunction printer as it can print, copy and scan. It is small and compact but it does not fax. It is suitable for operating in a small or home business. HP LaserJet Pro 100 printer is a highly compact printer as it measures 17.4 inches in width, 12.7 inches in depth and 13.3 inches in height. It is highly flexible as it supports Wi-fi, Ethernet networking and HP's ePrint technology for printing from mobile devices. The printing and scanning can be done from a PC only as it does not have slots for memory card or USB flash drives. It can print at the speed of four colour pages per minute. The input tray has a capacity of 150 sheets and the output tray has a capacity of 50 sheets. HP LaserJet Pro 100 has a 35-page Automatic Document Feeder and the HP LaserJet Pro 100 toner cartridges are easy to install and replace and have a monthly cycle of 20,000 pages. HP LaserJet Pro 100 printer is a multifunction printer suited for small or home business. With a high cost of HP LaserJet Pro 100 toner cartridges, its yield is quite low. 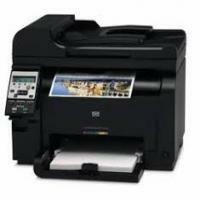 It has high RAM and supports Wi-fi, Ethernet networking and HP's ePrint technology for printing from mobile devices. But it lacks automatic duplexing and also cannot make copies of photographs of people well. Q. I have to print more of text documents than coloured images. If I buy a four pack set of HP LaserJet Pro 100 toner cartridges, does the black cartridge in it print more number of pages or I should buy an extra one for printing documents? A. The four pack set of these toner cartridges includes the black cartridge that prints 1,200 pages while coloured cartridges print 1,000 pages each. You may calculate your requirement for printing text documents and decide whether you want to buy extra black cartridge accordingly. Q. Is the quality of all cartridges in multipacks good or is it better to buy each individually? A. All the cartridges in multipacks are as good as single ones; each cartridge is tested in individual capacity and included in multipacks only aftew they pass quality tests. Q. I’ve been using original brand HP LaserJet Pro 100 toner cartridges but it’s turning out to be very costly. If I buy these compatible cartridges from you instead, can you tell me how much would I start saving and if you can offer consistent customer support as well? A. Our compatible toner cartridges will save you as much as 50% and yield the same results and performance, so switching over to compatibles will be an advantageous step. We also provide friendly, dedicated customer support that you can access whenever you need so you are never inconvenienced. Q. I need a black toner cartridge that prints high-quality images and graphics besides text documents. Would you recommend HP LaserJet Pro 100 toner cartridge? I have an HP LaserJet Pro 100 printer. A. This black HP toner cartridge prints vividly sharp text documents and has a rich gloss that also yields professional quality images and graphics. in addition, you can print on a wide variety laser papers with these toner cartridges for diverse effects and output you may need. Q. What are the environmental benefits of using the HP LaserJet Pro 100 printer? Q. Can I still print when an HP LaserJet Pro 100 toner cartridge or imaging drum is at its estimated end of life? A. When you got the message indicating ‘Low toner’ for the colour print cartridge or the imaging drum: The product indicates that a supply level is low. The Actual life remaining in the cartridge might vary. Consider having a replacement available for this printer when the print quality is no longer acceptable. The supply does not need to be replaced till you get the message of very low state. Q. What should I do if there is a jam in the cartridge area? A. When the product has detected a paper jam in the print cartridge area, clear the jam from the area indicated in the message, and then follow the control panel instructions as shown on your screen. Q. What are the disadvantages of this HP LaserJet Pro 100 printer that I should know before purchasing? A. The printer is not suitable for making copies of photographs and also does not support automatic duplexing. The Cost of the HP LaserJet Pro 100 toner cartridges is quite high but it lacks in producing the good yield. Also, the speed of the printer is slower comparing to the printing speed of the other HP laserjet printers. Q. Can I print directly using the mobile device? A. Yes, the printer supports the HP's ePrint technology for printing directly from mobile devices.